Bringing your kids to the Keystone State? From the outdoorsy ​Pocono Mountains to the chocolatey sweetness of Hershey and around the rest of Pennsylvania, these resorts offer plenty for families to love. Looking for a grand old mountain lodge on the East Coast? Skytop Lodge in Pennsylvania's Pocono Mountains offers families a wonderful chance to get away from it all and play in the Great Outdoors. Centered around an enormous stone lodge, the resort has been welcoming guests since 1928 to its spectacular 5,500 acres. Extensive facilities include riding stables, a golf course, an indoor and outdoor pool, basketball and tennis courts, croquet lawn, archery range, paintball field, geocaching circuit, driving range, playground, and game room. The lake provides swimming, fishing, kayaking, and canoeing in the summer and skating and ice fishing in the winter. Great Wolf Lodge is a large indoor waterpark resort chain with over a dozen properties scattered around the country. 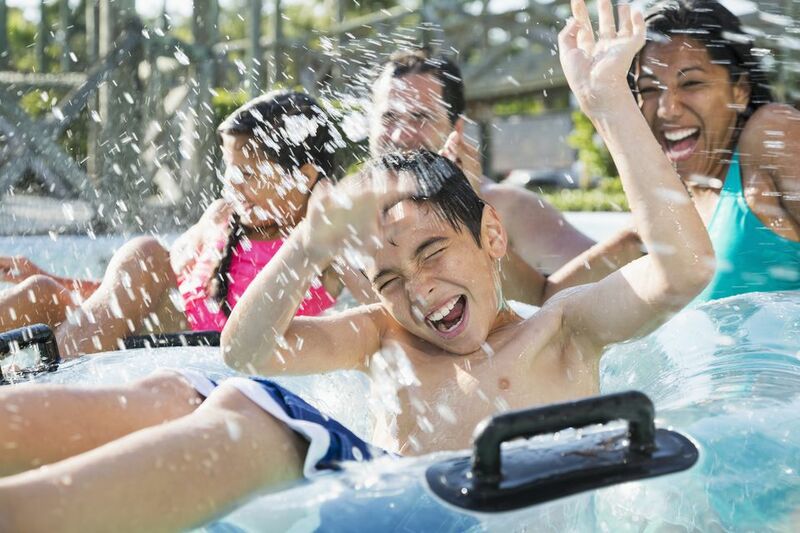 Families flock to Great Wolf Lodge Poconos for the splashy fun (numerous waterslides, a wave pool, kiddie pool, lazy river, climbing fort with tipping bucket, surfing simulator, and more), as well as dry activities such as bowling, mini golf, and the Magiquest interactive fantasy game. The location in the Pocono Mountains is about two hours from New York City and two hours and 15 minutes from Philadelphia. A four-season all-inclusive resort in the Poconos, Woodloch Resort offers family meals, a variety of lodging and myriad activities to keep kids and parents busy. Think cruise ship on land, with myriad amenities including swimming pools (outdoors and indoors), lake watersports, go-karts, and family fun such as contests and scavenger hunts. In the winter, there's snow tubing, ice skating, snowmobiling, and snowshoeing. This is a social place, and many of the family activities are group-participation style. Living up to its nickname of Chocolate Town USA, Hershey is a sweet-themed town that evolved into one of the most popular family destinations on the East Coast. Along with the Hershey Park theme park known for its thrilling roller coasters, the town offers some excellent places to stay and a raft of chocolatey attractions, including a zoo, botanic garden, and Hershey's Chocolate World. Hotel Hershey is a luxury hotel with upscale restaurants and a spa, while Hershey Lodge is a mid-range hotel with plenty to do for families. Opened in 2015, Kalahari Resort brings some competition to Great Wolf Lodge Poconos (above). Guests have complimentary access to a huge indoor water park with several waterslides, a lazy river, splash pads and a surfing simulator. Out of the water, there are scavenger hunts, cookie decorating, blacklight mini golf and seven on-site restaurants. The year-round upscale Nemacolin Woodlands Resort is set on 2,400 acres in southeastern Pennsylvania and is known for its huge array of family activities. From the adventure center (rock climbing, kayaking, paintball, archery) to the equestrian center and Mystic Mountain downhill ski area, families are never at a loss for something to do. Located in South Pennsylvania’s scenic Cumberland Valley just 90 minutes from Pittsburgh and two hours from Washington, DC, Omni Bedford Springs Resort offers a mineral spring spa, miles of hiking trails, an 18-hole golf course, and an outdoor pool and heated mineral springs-fed indoor pool. Yet another indoor water park resort to open in the Poconos in 2015, the 450-room Camelback Lodge features the enormous Aquatopia Indoor Waterpark as well as rock climbing, laser tag, and an arcade, and many more family activities.The lodge offers a wide variety of room categories, from standard rooms to six-person suites and multi-bedroom condos that sleep up to 14. Once a hunting and fishing lodge in the popular Poconos region of Pennsylvania, Split Rock is an expansive and reasonably priced four-season resort on over 1,200 acres in the town of Lake Harmony.